THE IMAGE BELOW CONTAINS THE BACK COVER OF A TEST PRESS. REALLY SUCCESSFUL SONGS ON THAT THING. IRON LUNG RECORDS DOES IT RIGHT; ESPECIALLY WITH THE TEST PRESS. IT JUST SOUNDS BETTER WHEN THE DESIGN IS PALATABLE. THE BLACK COVER IS THE J-CARD FOR THE BITE ITSELF/SELF COM SPLIT C-20 CASSETTE. BITE ITSELF IS SANDERS CREASY (UNPERSONS/PHT). SELF COM IS NIC SCHMIDT (MUTANT VIDEO/FEEDING). THE BITE ITSELF SIDE IS PSYCHOLOGICAL. THE SELF COM SIDE IS PERSONABLE FOR AWKWARD PEOPLE. 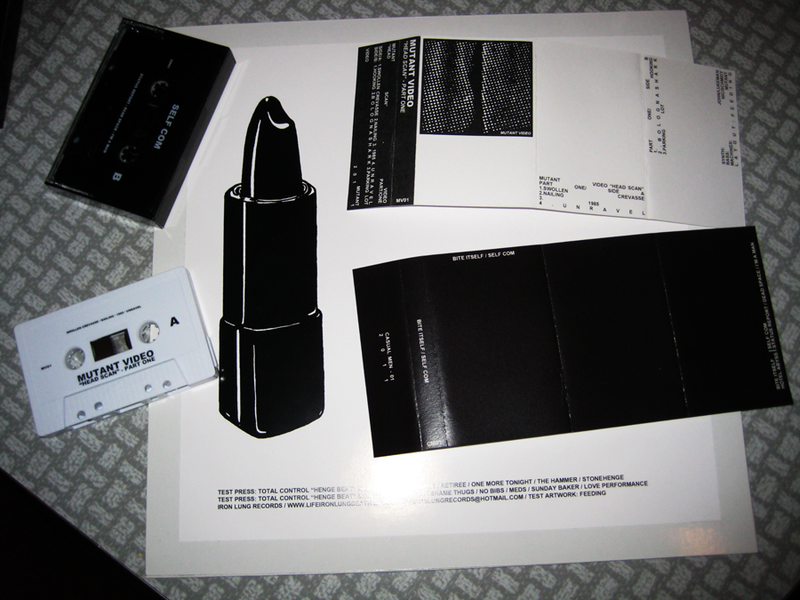 THE OTHER J-CARD IS FOR MUTANT VIDEO'S "HEAD SCAN" - PART ONE, A C-60 CASSETTE. MUTANT VIDEO CONSISTS OF JOHN LUKEMAN (DROWNER/WWDIS) AND NIC SCHMIDT (SELF COM/FEEDING). THIS SOUNDS AND FEELS LIKE AN ALTERNATE REALITY OF THE 80'S. BLACK T-SHIRTS, BLACK DRESS SOCKS, JEAN SHORTS, CAR WAX, LEATHER GLOVES AND LUBRICATION. SYNTH. BASS. AND MACHINES. MUTANT VIDEO IS ALSO A VIDEO-BASED PROJECT. THEY ARE CURRENTLY WORKING ON THEIR LP, "MISSING FINGERS". CLICK HERE FOR PURCHASE INFO. CONTACT FEEDFEEDING@GMAIL.COM IF YOU'RE INTERESTED IN THE BITE ITSELF / SELF COM SPLIT. $5 US/$7 ELSEWHERE/ $0 INTERNET LINK ABOVE. THANK YOU.